The past year has seen Brainwavz refresh their product line with great success in particular they released a model called the s1 which we noted for its excellent rugged and extremely comfortable, design. The sound of the s1 was bass orientated making for one of the best sets of work out headphones we have ever used and still the set that we recommend today for that purpose. However, what happens when you take that same amazing design and but aim for a more refined listening experience? 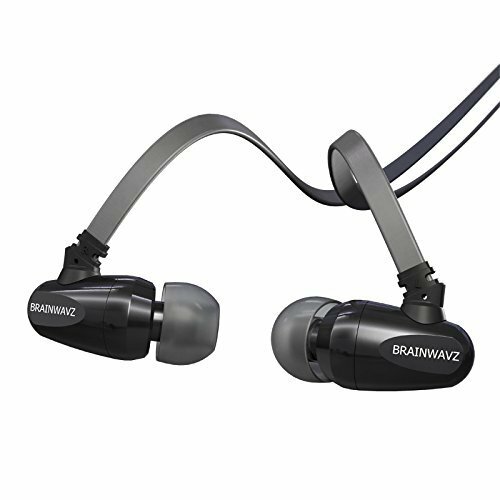 You get the new Brainwazvz S5. Set to retail at around $99 the S5 features a refined version of the s1 housing with a new 10mm dynamic driver inside claimed to produce a higher end sound, lets take a look. Packaging is much the same as it was with the s1. It comes in a nice box to display all the relevant information about the IEM's as well as presenting the earphones themselves nicely through the viewing window insert. Its a nice design and keeps itself in line with the rest of the new product line up by Brainwavz. We were again very pleased with the accessory pack provided by Brainwavz, a company know for putting some effort into making enthusiasts happy. There is a very nice hard case included with room inside for the earphones and will even a player like the Sansa Clip and some spare ear tips. This is a very nice touch and one that we would like other retailers would follow, in our eyes once you start paying over $50 for a set of headphones then you are going to want to protect them. There are the usual array of S, M, L tips on offer and they are right up there with some of the comfiest and best sealing tips on the market, we give the Brainwavz tips our highest commendation. Finally there are a couple of little bonus's including a set of comply foam tips and a ¼ inch jack adapter that is beautifully made and its certainly a step above the usual generic style adapters. Love it. They are sleek, robust and very cool looking. There is a new darker colour theme in play to set the S5 apart from the previous S1 and this is certainly for the better. Not that there was anything at all wrong with the looks of the S1, its a good looking IEM in its own right but the S5 does take it up a notch making for a classier affair. The driver housing itself is new and now features a rounded design on the end which, rather amazingly, manages to make these guys even more comfortable. The cable is extremely robust and does a great job of staying tangle free whilst the strain reliefs and cable cinch is right up there with the strongest we have seen, the S5 should last a long time and cope with most of lifes stresses. As was the case with the S1 its the build quality that shines here, they really are on of the sturdiest and most comfortable designs on the market. Due to the excellent fit and seal when using the medium sized silicone tips we found the S5 to be very good isolators and the would work well for commuting/traveling. Due to them sticking out the ears a little though they might keep the volume down but we cant recommend to those that like to sleep on their side. Unbelievably comfortable over prolonged use the S5 are also very easy to insert and have remarkably low micro-phonics when worn over the ear. Cable length is good allowing us to keep our player pocketed with enough slack even standing at 6'2. Brainwavz really got the design right here. The S5 are so similar to the S1 in style that when you put them in you are expecting the same energetic bass slanted sound to pour out them. That wasn't the case and when you get into it you realise the sound is tightened up and refined in many areas even if it is now quite balanced. I cannot agree with the initial impressions I have read from other users that its a very flat sound, to me these are like a more refined yet still bass slanted version of the S1 which did have decent energy about them. The reasonably large. Decay and pratt is nice here in a way reminiscent of the Panasonic HJE-900. The signature is mid centric with a laid back treble and a bump to the low end, it is certainly not balanced though. The low end was particularly interesting remaining tighter than the S1. Highs – Just as we like it clear and clean but not a hint of sibilance to be found leads to a pleasant and non fatiguing listen. High-heads will like a touch more sparkle on the top end but for the majority of users the highs are in the right zone. Detail is average and not overly amazing but clarity is quite ok. Lows – Low can get down there when they need to. Not the lowest of the low and thats kind of the point of the S5, to be complimentary to the S1 with its enhanced low end. The bass on show in the S5 is punchy but not at all flat sounding it is still the prominent feature. The lows never really bleed into the upper frequencies though and this is most likely a contributing factor towards the moderatley uncluttered sound that the S5 portray on a whole. Brainwavz have yet again produced an excellent set of IEM's and yet again prove that they listen to their customers however I think the price is set to high to be competitive. When the B2 was around we asked for sturdier cables, we were given one of the sturdiest in the S1. We asked for more comfort and they deliver on of the comfiest non custom IEM's on the market. We asked for the S1 body with a more refined sound, we now have the S5. There are certainly IEM's that do better at $100 based on sound but given my enjoyment of the design as mentioned in the S1 review they could be worth considering if you want a slightly tighter sound. The comfort and durability make them right at the top of the pile for commuters but we suggest anyone looking for a mid priced set of IEM's look elsewhere, however if the price were to be some $30-$40 lower they would be worth higher consideration.